After several postponements, a general election will take place on March 24, 2019, officially ending the rule of the military government. However, regardless of the election outcome the military will probably continue to strongly influence or even dominate any new administration, either formally or behind the scenes. A new constitution passed in 2017 curbs the powers of populist politicians while preserving the military’s major political influence. 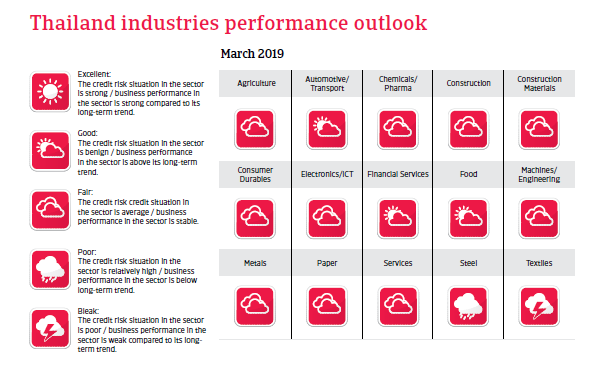 Political tensions could re-emerge ahead of and after the elections, potentially affecting international trade and investment. The simmering conflict arising from the deep political, social and economic division between the old establishment (army, judiciary and urban upper class) in the south and the rural poor in the north has yet to be resolved, and is unlikely to disappear soon. 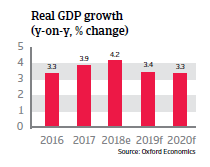 Although relying heavily on tourism, merchandise exports and public investments for growth the Thai economy is rather diversified. The service sector accounts for about 55% of GDP, manufacturing for 27% and agriculture/fishing for 9%. The working population will start to decline in 2019, which could produce a significant drag on long-term growth. 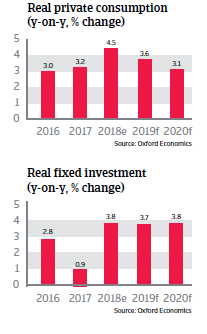 Economic expansion is expected to slow down in 2019 and 2010 due to lower export growth, but to remain above 3% p.a., mainly sustained by private consumption and public infrastructure investments. It is expected that after the March 2019 elections any new government will proceed with large infrastructure projects and attract foreign investors with the establishment of a large special economic zone. Despite increased public spending, government finances remain sustainable. Public debt remains below 50% of GDP and mostly domestically financed, which provides resilience against external shocks. The government tries to finance increased infrastructure spending with higher tax income. The Thai banking sector is healthy, as banks are well capitalised. The Thai baht is subject to a managed floating exchange rate regime, which reduces volatility risks. However the high level of household debt (78% of GDP in 2018) remains an issue, although bank lending has grown at a slower pace since 2013. Due to low inflation and a large external surplus supporting the baht exchange there is plenty of scope for continued accommodative monetary policy. However, this could encourage businesses and households to borrow even more, resulting in greater financial stress when interest rates start to rise again. An unexpected rise of global interest rates could lead to problems, since Thai lenders finance an increasing share of their loans through wholesale funding.